Contour's cheapest camera is also its most versatile -- it's waterproof to a depth of one metre. This should make it great for all-weather sports (think surfing, skiing, whitewater rafting) where other Contour models or competing sports cameras require a bulky waterproof case. The quality of the video is good, the camera handles low light reasonably well, and plenty of accessories are available. It doesn't have the Bluetooth viewfinder option of the more expensive Contour+, and you'll need a computer handy to change video quality and other settings. When we looked at the Contour+ video camera we were impressed with its video quality and size, but of more value was its miniature construction — it easily fit in a pocket, or could be thrown in a backpack. What made it great was the extra Bluetooth functionality that turned a smartphone into the camera’s viewfinder, allowing easy position and exposure adjustments. Contour’s new ROAM doesn’t have this feature, but it is the same convenient size and is also waterproof to a depth of one metre. We put it through a few tests to see how it performed. The Contour ROAM is largely similar to the Contour+ in design. It’s got a bullet-shaped chassis that’s constructed from aluminium and strong ABS plastic, with a single sliding switch up top and a single button on the rear — tap the rear button to turn the camera on and power up the alignment laser, and slide the top switch to begin and end recordings. 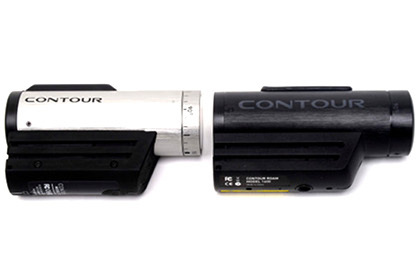 The ROAM has two rails on its sides, which can be used to attach the camera to Contour’s wide range of accessories. To test the ROAM we used a windshield mount and one of the flat surface mounts we tested the Contour+ with. There’s also a 1/4” tripod screw in the camera’s base. The plastic surround for the rear button pops up to reveal the camera’s innards, exposing hidden buttons to reset the camera and format internal memory, as well as a slot for the MicroSD memory cards that the Contour ROAM records onto. There’s no battery slot as the ROAM’s 1350mAh cell is inbuilt. You can use MicroSD cards of up to 32GB in size in the Contour ROAM, although for recording Full HD 1080p video you’ll want them to be Class 6 or faster (this means a few extra dollars). It’s not a huge expense to buy a card or two, though — we found Sandisk Mobile Ultra 16GB SDHC Class 6 cards for around $40 online. Tap the button on the rear of the camera, and a bright red alignment laser shines from the front of the Contour ROAM just above the lens. You use this to set the correct horizon and angle of the camera and its lens — which can rotate over a 270-degree range of motion, working well with the ROAM’s three possible mounting points to almost always allow a perfectly level field of view. We did notice that the alignment laser was not very useful in bright light, though; if you’re setting the ROAM up in bright light you might find it difficult to fine-tune what it’s looking at.